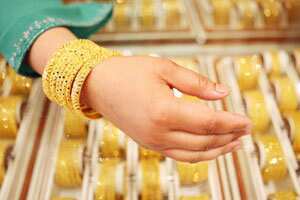 Mumbai: A fall in overseas gold market failed to lift physical demand in India, the world’s top consumer, as the depreciating rupee kept prices steady in the local market. At 3:05 pm, the most-active February gold contract on the Multi Commodity Exchange was unchanged at Rs27,651 per 10 grams. “Rupee has gone down considerably, and general feel among consumers is that gold will fall from the current levels. That’s why demand is not improving," said a Mumbai-based dealer with a private bank dealing in bullion. “We can see improvement in demand if prices go down to $1,560 per ounce level. Even price rise above $1,650 level will attract buyers. Then people will change their medium term view," the dealer said. International gold was trading at $1,585. The on going Khar mass also affected on purchases, dealers said. Khar Mass is a month in the Hindu calendar from 16 December to 14 January which is considered inauspicious for gold buying and starting new ventures. International spot gold edged lower on Wednesday, tracking falls in industrial metals and equities, as concerns about global economic growth weighed on market sentiment amid thin year-end trading volumes. The rupee, which plays an important role in determining the landed cost of dollar-quoted gold, weakened to 53.36 to the dollar from 53.015/025 at Tuesday’s close, weighed by dollar demand from oil companies and weak shares. A Reuters poll earlier this month of 20 hedge fund managers, economists and traders showed international spot gold prices are expected to fall below $1,500 an ounce over the next three months and they are unlikely to retest September’s all-time highs until later 2012 at the earliest.